You Are Here: Home » Around the Web » Swoon Sunday: Chris Winslow from Cate Cameron’s Playing Defense! Welcome to Swoon Sunday where you get to meet some of our swoon-worthy heroes. 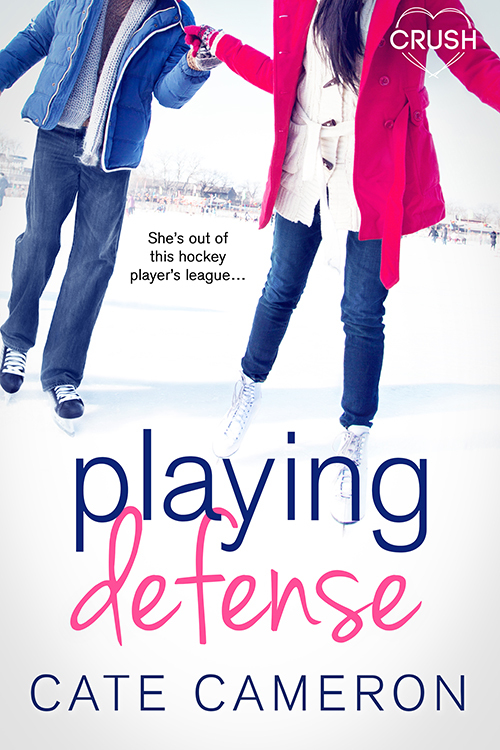 Today we have a visit from Chris Winslow from Playing Defense by Cate Cameron! Damn, a profession? That’s kinda ambitious, isn’t it? I mean, I guess technically I’m a pro already, since I get paid for playing hockey—my mom was not impressed when she found out playing in the OHL made me ineligible for US scholarships. But the team barely pays me enough to cover my expenses, so it’s hard to call it a profession, right? Still, I’d say hockey. Every day on the ice is a good day. If that doesn’t work out? Maybe…maybe something in sales? I like people, and they usually like me back. Or some kind of entertainment. Hey, stripping! I think stripping should definitely be on the list of possibilities. Hockey or stripping. Those are my final answers. For now. The rink, probably. The OHL is a weird gig—we get drafted at sixteen, when we’re too young to live on our own, technically, so they billet us with families in the community. I really like my billet family, and they’re huge hockey fans and super friendly, but it’s still their house, not mine. You know? And going back to visit my parents is kind of weird, now. My room there is bigger than the one at my billet, but it still feels kinda small to me. Like I outgrew it, I guess. But I don’t think I’ll ever outgrow a hockey rink. That’s a lifetime home. I listen to everything. Like the song right now is old-school country (“She Stopped Loving Him Today,” and, NO, I’m not crying!) but my phone’s on shuffle and the next song could be punk or metal or classical or rap or anything. Wait, this song’s just finishing… I’ll tell you in a second… Oh. Okay, remember how I said I listen to everything? Well, obviously I meant it. Currently playing is “Sorry.” By Justin Bieber. And I really am sorry it’s playing, because now I look like a big weenie. But, hey, he’s Canadian, right? That counts for something. But, actually, the opposite – both! Boxer briefs. I’m a compromise kinda guy. Both. Sleep is for the weak. Although I love a good nap—doesn’t really count as sleep, so I’m not weak. I’m just pleasantly refreshed! They both freak me out. I’m the baby of my family and I’m pretty sure there was some kind of sibling-inflicted childhood trauma related to peanut butter. There was definitely a trauma related to vacuum cleaners—“We vacuum up little specks of dirt, and you’re just a tiny speck of dirt, Chris! You’re going to get vacuumed up!” and then lots of chasing and screaming—and I get the same sort of trying-not-to-panic feeling when I think about peanut butter. Like maybe they crammed my mouth full of it and I felt like I was choking? They deny this, but they deny the vacuum stuff too, so—my family members are all liars. This is the sort of serious stuff I have to deal with. I tell you—I have deep inner pain. Corrigan Falls Raiders! Hell, yeah! Chunky Monkey. (I don’t actually like this flavour, but… I like the name!) And, hey, congrats on the Canadian spelling of “flavour”! Good to see! When we finally came up for air, Claudia had her bare feet on top of my shoes, and she was pressed up against the brick column between their two garage doors, my forearms braced on either side of her head, our bodies lined up and pressed together in as many points of connection as we’d been able to find. And I didn’t really remember how any of that had happened. I just remembered sensations, not events.